I am not a biblical scholar and have, frankly, never been a fan of the Bible. But I have recently discovered the writings of Aramaic scholar Neil Douglas-Klotz. Writings that have given me new appreciation for the scriptures. To date, my only encounters with the Bible have been the King James version which was written for…well, King James. An English translation completed in 1611, centuries after the first Catholic monks arrived in Ireland. Douglas-Klotz takes us back to the original language of Jesus and, based on the depth and complexity of meaning in the Aramaic language, offers new interpretations for familiar scriptures. Interpretations that hold profound insights for these times. Interpretations that were likely brought to Ireland by those early monks. Interpretations that would have resonated with ancient Irish spiritual doctrine. Love your enemies (Luke 6:27,35, King James Version), is a passage many of us are grappling with. But consider this interpretation and explanation by Douglas-Klotz. out of time with you. Bring yourself back into rhythm within. like two lovers creating life from dust. Do this work in secret, so they don’t know. This kind of love creates, it doesn’t emote. There is a mysticism here that speaks to my soul. There is an approach here that speaks to my warrior. Wisdom, rooted in ancient truth, for these times. For all times. 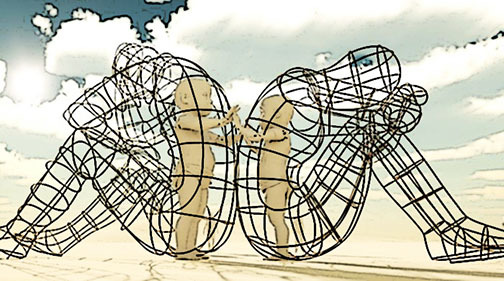 With appreciation for this sculpture, Love, by Ukranian artist Alexander Milov. This writing so speaks to me. Thank you.